Nov. 97 – Dec 99, Research Associate on project by ASI, Univ. 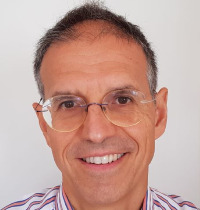 of Roma I "La Sapienza"
Fabio Massacci main research interests are in the field of Automated Reasoning and Formal Methods, Security Engineering and Verification, Security and Trust Management for Autonomic Systems. Ida SR Siahaan on automata modulo theory for mobile code and sensor networks. Hugo Lopez on web service security and process algebras. Natalia Bielova on Security Compliance for SOC. Ayda Saidane from LAAS-CNRS working on SERENITY. Nicola Dragoni from University of Bologna working on S3MS. Member of the ACM, IEEE and Chartered engineer. Has been invited speaker at the security session of MFPS, FCS and Verify-02 ed has kept an invited tutorial at TABLEAUX-98, IJCAI-03, IEEE RE-06 (jointly with N. Zannone and J. Mylopoulos), at ESSLI-05 (with H. koshutanski) at the International School on Foundations of Security Analysis and Design FOSAD-01 and 05. He has been member for 4 years of the European Executive of Service Civil internazionale (International NGO with consultive status at UNESCO and Council of europe and member of the European Youth Forum), he has also been European Treasurer since 1991 till 1994.
he has been national treasurer of ICS (Consorzio Italiano di Solidarietà) in 1994.